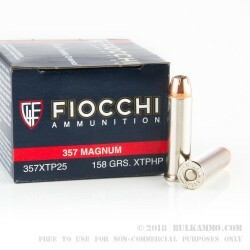 Fiocchi is one of Italy's largest and oldest ammunition manufacturers, and since their foundation in 1876 have perfected their craft -- to be sure, they’ve won several awards for their commitment to quality. 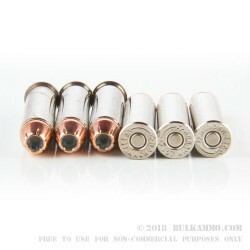 They introduced their XTP (Extreme Terminal Performance) line of ammunition in 2009, and it is ideal for the specific demands of personal protection. 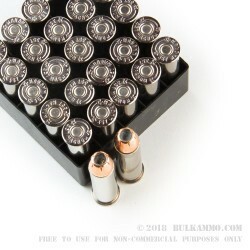 This cartridge sports a jacketed hollow point bullet, so you can count on it to not foul your barrel with lead during training, reliably penetrate your target, and mushroom within to cause debilitating damage. Its Boxer primed brass casing is nickel-plated, so it will feed smoothly into your cylinder and eject just as well. Handloaders will appreciate this cartridge in particular. Your well-being is the last area in which you should compromise over quality. 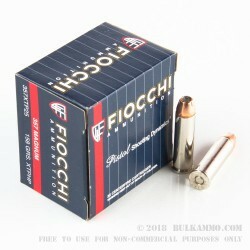 Rely on Fiocchi’s expertise and this round’s impressive knockdown power for true peace of mind.